OSWEGO, NY – Oswego Country Club announced recently the hiring of local food and beverage professionals, Ray Jock and partner Tammy Murphy, to manage the food and hospitality operations for the club, according to Board President Matthew Bacon. Jock, and his wife Kimberly, own La Parrilla Grill and Wine Bar, and Murphy, who has worked in the restaurant/bar industry for more than 30 years, have formed LaP&T @ OCC, and began the management of all food operations effective April 1. 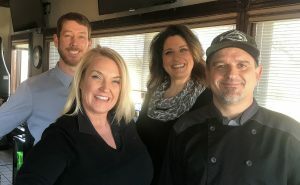 Pictured at the Oswego Country Club recently are from left::board president Matthew Bacon and new club restaurant/bar operators Tammy Murphy, Kimberly Jock and Ray Jock. As a chef of more than 20 years, Jock has continuously impressed patrons whether as a private executive chef, restaurant owner, or simply a volunteer cook. Jock and his wife, Kimberly, are known for their Oswego-restaurant La Parrilla, which opened after Ray spent years working in restaurant management in New York City. Murphy, an Oswego native, has decades of bartending and management experience in the restaurant/bar industry. She is well-known in the Oswego restaurant community, and is an active volunteer for many local events, charities, and organizations. In addition to welcoming the new restaurant management team, Oswego Country Club has also restructured its “Corporate Membership” classification. This membership classification is held in the name of and paid for by a company or organization. Corporate membership allows the company or organization who holds the membership up to 50 18-hole rounds of golf at the Oswego Country Club (cart included) for employees and/or guests. Tee times arranged through the pro shop are required.